So you're looking for the best Huawei P20 Pro case. Good plan: the Huawei P20 Pro is one of the best camera phones right now. It's very expensive – not to mention slippery and fragile – and we strongly recommend putting it in the best phone case you can afford. But which one? Right now, we think the best Huawei P20 Pro case is the Spigen Marked Armor case, thanks to its balance of protection, fit and reasonable price. But there are many options to choose from – and they aren’t all made equal. Key considerations to make before shelling out for a case include the camera cut-out: make sure it protrudes further from the back of the phone than the lens itself. Otherwise, if you drop your Huawei P20 Pro you could end up with a shattered lens. Price, appearance, material and extra functionality are all additional factors. The Spigen Marked Armor case is our top pick for the Huawei P20 Pro – we think it's the best case you can buy right now. Sporting a camera cut-out that’s both accurate and has a raised lip – so it sticks out further than the lenses, keeping them protected in the event of a drop – the Spigen Marked Armor also strikes a good balance between style and protection. 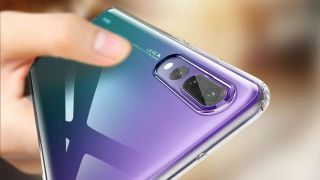 It has a grippy back and it’s not as chunky as some of the more heavy-duty Huawei P20 Pro cases, yet thanks to air cushion technology in the corners it can really help your phone survive a fall. In fact, Huawei says it meets military drop test standards, and if it’s good enough for the military then it should be good enough for most people. The Ringke Fusion-X is another Huawei P20 Pro case with raised edges, not just at the front but also around the camera, so your phone is shielded from drops onto even surfaces. Like the Spigen Mark Armor phone case at number one, this also meets military drop test standards, with the help of shock-absorbing bumpers. The edges of the case are also easy to grip, so you’re less likely to drop it in the first place, and the Fusion-X has a largely transparent back, so you can see more of your phone, which is especially desirable if you opted for the multi-coloured Twilight version of the handset. The only real downside to the Fusion-X is that, in Ringke’s own words, it has an “ultra-rugged design”. That will appeal to some, but does mean it looks chunkier than others might like. The ESR Crystal Clear case for Huawei P20 Pro is a great budget pick, coming in at under £10. For that money you don’t get a huge amount of protection, but it does have more than just price going for it. For one thing, the ESR Crystal Clear case is, as the name suggests, completely transparent, so you can still show off your phone in full. It’s also very thin at just 1.2mm, so it adds minimal bulk to your pocket. Yet the edges around the camera are raised to 1.45mm, ensuring the lenses are protected from falls. Plus, the ESR case also claims to sport anti-yellowing material, to keep it pristine for longer. If you're looking for a cheap Huawei P20 Pro case, this is one of the better options. The Snakehive Genuine Leather Wallet is one of the more premium cases you can get for the Huawei P20 Pro in terms of both price and appearance. Beyond its leather looks it stands out thanks to slots for your cards, so there’s no need to carry a wallet, and thanks to the ability to fold it out into a stand for your phone. It also sports precise cut-outs, giving your camera the clearance it needs, and while the Snakehive wallet doesn’t have the fancy drop protection technology of some cases on this list, it does at least fold over to protect the screen, which is more than most can say. This Supcase option is one of the most protective phone cases you can get for your Huawei P20 Pro, even going so far as to include a built-in screen protector. It’s a hefty thing but should keep your phone safe from all but the worst accidents. And that protection extends to the camera, as like most of the best cases, this sticks out beyond the lens. The sides are designed to make it easy to get a secure grip and as an added bonus there’s a kickstand, so you can prop the phone up in landscape or portrait orientation. If you put protection above all else, then you should consider the Love Mei Powerful Case for Huawei P20 Pro. Yes, it’s big; yes, it’s heavy; but yes, it will keep your phone safe. It’s made of metal, so it’s seriously tough, and it has port covers to keep out dust. As you’d expect it also has raised edges around the camera, so that part of your P20 Pro isn’t any more exposed than it needs to be. Some versions of the case also have a built-in screen protector. This will absolutely be overkill for most people, but if you’re an adventurer – or accident prone – then this is for you. If you’re after a case that’s both unusual and stylish, consider this wooden option from Kwmobile. Available in walnut or bamboo, this uses real wood on the back, meaning each case is different (as it will have a unique wood grain). There are precise cut-outs around the camera, a rubber frame gives you some shock protection, and while this isn’t the most protective case around, it’s a lot better than no case looks good to boot. This isn’t something you see very often – a waterproof phone case. It supposedly exceeds the IP68 rating and can be submerged in up to 10ft of water for up to two hours. We’re not sure we’d want to risk that, but at the very least it will boost the basic water resistance the P20 Pro itself has. Beyond that, this is a chunky Huawei P20 Pro case with a built-in screen protector and sealed ports. It even has a transparent cover over the camera lenses, so it goes beyond most in terms of keeping the camera safe – though at the cost of having a piece of plastic over the lens. This DueDue phone case for Huawei P20 Pro has a linen cloth material on the back, making it different to look at and soft to hold. It also has a kickstand for convenient video viewing, and raised edges around the camera to protect the lens. Protection looks to be fairly basic – though the cloth supposedly adds extra friction to prevent the P20 Pro from slipping out of your hands. Overall this is one to buy if you like the design and want something a little different.